Home › Search engine optimization › Page Speed is it important? Page Speed test – Is this important or not? This article is prompted due to personal experience. My clients are mainly medium to smaller-sized business. Recently, it came to my attention that a vast majority of clients across most market segments are not aware of the Page Speed tests for their mobile and desktop sites. According to a 2016 report, Google still use desktop web pages to rank mobile sites. This, however, will be changing when Google launch its mobile algorithm (latest estimate is end 2018). The purpose of this article is to create awareness with customers that it is better to be mobile optimized than not. Why is business not aware of this important ranking factor? The answer could be simple. Business owners do not have time to focus on SEO and or web development / marketing. In any given business it is the responsibility of the IT department. Not necessarily. Yes, Page Speed compliance is a function of web development. However, your web developer and designers/marketers need to collaborate in order to find the optimal point where beautiful designs load fast. in order to elicit a call to action. Remember, you have less than 1 second to grab someone’s attention ~ according to Google…. In 2014, ComScore produced the above graph based on market research. 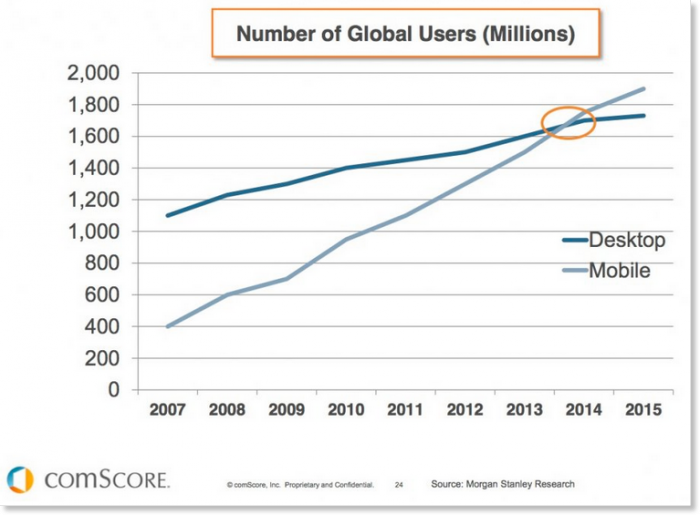 Yes, 3 years ago, Mobile users surfing the web, using mobile handsets, exceeded desktop users. This, however, goes back as far as April 2010, when Matt Cutts reported that Google count page speed as a ranking factor. As a result, Google set up a list of parameters to ensure that sites render in under a second on a mobile network and help website owners and webmasters to achieve this goal. Speed has always been a big thing with Google. As a matter of fact, the one thing that never changed since Google’s launch in 1998, is the time in which search results are listed. The bottom line is that nobody is willing to wait for anything. Mobile handset users wants the information on the fly when they search on the move. In this case, time is no man’s friend. Simply go to the Google speed test tool and enter your URL (website address). In our results, we have to fix two issues – browser caching and we have to reduce our server response time. When I click on the Leverage browser caching, I get a list of links causing the page to load slow. The links, are however, not links from my site. They are external links and there is not much one can do to fix this, as the links are external. Having said that, I will look into using alternative sources or move / change links, in order to gain control without loosing the functionality on my site. This might take a bit of time but I am not going to break my head about that right now. 92/100 is a pretty good score for the test site. The second issue with my test site, is the server response time. The site loads in 0.32 seconds (which is less than the 1 second they require), but digging deeper, I note that Google wants my site to load in 0.002 seconds. It is recommended to also test your site from various destinations, using a tool such as Pingdom or GT Metrix. There is always the option to move the site to better hosting companies but we all have hosting agreements which we have to honor. This test is something we will work on but we are not going to stop business because of it. Speed and user experience matters. Whether you are the content marketer, marketing manager, web developer or CEO of the company, it matters. Work as a team to resolve these issues. Google is very helpful and tells you how to do it on their insights pages. With all the research I did to try and obtain a 100% score, I learned that it is nearly impossible if you use CMS systems such as WordPress (or any other CMS tools). One should also not obsess about the score. It is however, helpful and good practice to sort out the potential issues that could slow down your website. There will be elements you control and elements you do not control. Fix what you can and just try to keep within the 70-90 page score the gurus talk about. Always get a second opinion by using alternative page speed tools such as pingdom or GT metrix. Slow load times can lead to a visitor simply leaving your website, seeking their information elsewhere. If they came from our search results that may appear to us to be an unsatisfactory result that we showed. Faster is better, but take care to balance absolute page load speed with a positive, useful user experience. If all else fails, contact us for a consult!